Note: This post is completely based on my personal experience with Hypothyroidism. It is nowhere meant to harm anybody's sentiments or complications arising due to the reasons whatsoever stated in thi blog post. It has been more than one year that I have been suffering. I am tired of throwing away money at all the doctors and medicines without any sign of improvement at all. Last year in the month of July, I had a severe lower back injury while doing squats. My back exploded and I felt like that it has been torn into two individual pieces. The pain was excruciating. Ever since then, I have not been able to have my back in good shape again. I am not able to stand for long, sit for long or even lie down for long. The problem that reflected in the X-Ray was a mere muscular spasm and nothing else. I had medicines which comprised of mainly the supplements for calcium, magnesium, vitamin B12 along with some muscle relaxants along with my regular Thyroid medicine (Thyronorm). I felt okay till the month of May this year. Yes, I had these medicines till then. After that, I was not able to stand, sit or do even a minor work. I will share all the symptoms in detail later in this post. I felt like a handicapped, paralyzed person who is always lying down in bed. The days and nights haunted me. Later on procrastination took over me. After a couple of months in July, I went off the medicines again. It was okay at first but symptoms came back to haunt me after two weeks. Again the same thing started. I went to the doctor, he suggested to get all my vitamins level checked. They were all good. He was also not able to understand the problem. X-ray still showed spasm to which I was like :O. Recently, in August, I complained of extreme heaviness in chest area. The feeling was not good at all. The pulse was 120 to 130 for at least four hours at a stretch. I got it checked and it was nothing serious. The doctor told me to get checked for TSH levels. I went on to get them checked the next day in the morning and it was also okay. The fast heart rate took around two days to settle down. I pondered over this recently. What I found out was that my heart rate always stood in the range of 90 110 in the past which I ignored. This time, however it was really impossible to avoid the feeling. Regarding the fatigue, I was not able to get up from my bed. Not even to take my breakfast, lunch or dinner. Have you observed that sometimes we want to wish our friend on any occasion, we remember it till the day and forget to wish on the day itself? This was only the beginning. I am good at remembering numbers. I have always been at this. The fact that I was forgetting the numbers ringed a bell in my ear. Whenever I heard a slightest sound like a horn on the road, I was about to kill the person for it. Yes, I was so much irritated by everything and everybody around me. My legs trembled while waling, sleeping or driving. While typing, my arms trembled. This is not a good feeling at all. Earlier, I used to ignore the feeling, but when it started happening frequently, I was terrified. I have been into fitness since very early age. I always wanted to have a good physique. I used to have it as well. But recently, no matter how much workout I do, I keep getting slimmer with no sign of muscle at all. Yes, all the muscle mass has left my body leaving me vulnerable. I felt cold like a corpse, dehydrated all the time despite having 15 to 20 glasses of water. My back was not recovering. Nothing helped me. At the end, I started with physiotherapy sessions. It gave me more relief than the medicines. It relaxed my muscles. But the problem persisted. Also, I sweat profusely. Even a bucket can be filled by my sweat. These are the worst kind of symptoms one can get. It breaks you down completely. I have been suffering from all these from almost four to five years but now they have taken over my mind. All my reports are normal, all ultrasounds, MRIs, XRays etc are absolutely normal, still I was not able to even stand up. I was feeling like I will collapse if I stand up. Now, I was frustrated with this behavior of my body. One day I was lying down on the heating pad during one of the physiotherapy sessions. 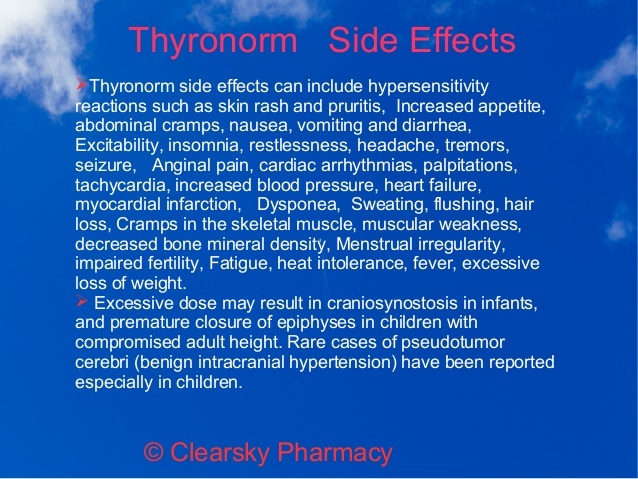 I just browsed through the side effects of the Thyroid medicine I was taking. I am taking Thyronorm 75 mcg. The dose has been adjusted as the higher doses were not suiting me. Earlier I was on 125 mcg which was reduced to 75 mcg gradually. As I went through the side effects, my jaw dropped. I was shocked to see all the above side effects listed there. My FT3, FT4 were absolutely normal and they are absolutely normal since Thyroid was detected. Only the fluctuations were in the TSH levels. They can be due to diet, lifestyle, stress and several other factors. 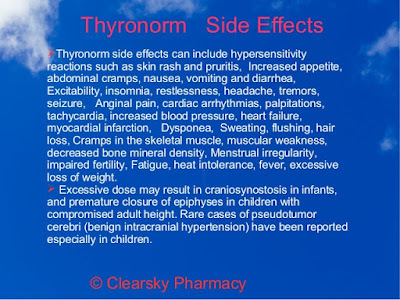 Also note that My TSH levels haven't been more than 6 (range is0.30 to 5.5) even with or without Thyronorm. Next day, I didn't take the tablet. That day I felt more fuller, I slept calmly, I was not disturbed even by loud horns and what all noises, I was feeling more energetic. The next day also, I didn't take the tablet. I felt more energetic, more fuller and my back muscles felt warmer (earlier they were chilled as ice all the time). Most of all, my heart rate cycled between 72 to 82 only (from 90to 110 always). That day, I went on to discuss this with my doctor. I spent around 15 to 20 minutes and explained everything to him. He was shocked that not one, not two, not three, but all the side effects were taking over me. He advised to quickly stop the medicine and wait for 10 days. Then I will go for another round of tests and then we will see what needs to be done. This is my personal experience with the medicine. This is not intended to force you to stop your medicine. But if you feel that some of these or all of the above side effects are troubling you, you can check after skipping one or two doses with your doctor's permission of course. It has been 3 days when I have been off from this medicine and believe me, I am feeling a way lot better than last one year of what I have been living in hell. Hope it is helpful for you as well. The next part related to this will be published soon. In that part, I will be sharing the importance of some of the vitamins and minerals for Thyroid disease. 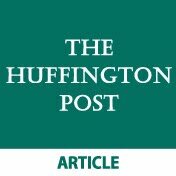 I hope this helps your readers. And I wish that you become completely as before Saurabh. Ye Anupam. It will take time as these have taken over my body and mind since last 6 years. The effects will take some time to go away.